design problem 5: who are you really? So you are interested in Anderson University’s visual arts program? Here at AU our students experience a program that is unlike any other program in the country. But before you dive into what Anderson’s art department is all about, you should first learn about the history and the masters of the greatest school of art and design that ever existed: the Bauhaus. After reading about the Bauhaus, you will then be able to understand just how special AU’s art program is, especially in relation to our Foundations course. You will see the similarities between AU’s Foundations and the Bauhaus’s preliminary course. But there is one key difference, which you will learn about later in this magazine. (Sorry, no spoiler alerts here.) This magazine features student work from our Foundations course and gives you a rare opportunity to see a glimpse of projects you will be doing if you decide Anderson is right for you. For each project, there is a brief description of what the project is, and how it is similar and different from projects assigned in the basic course at the Bauhaus. So sit back, grab a coffee, and dig into a rich history and unique program that you will not be able to find anywhere else in the country. The Bauhaus was a school whose approach to design and the combination of fine art and arts and crafts proved to be a major influence on the development of graphic design as well as much of 20th century modern art. Founded by Walter Gropius in Weimar, Germany in 1919, the school moved to Dessau in 1924 and then was forced to close its doors, under pressure from the Nazi political party, in 1933. The school favored simplified forms, rationality, functionality and the idea that mass production could live in harmony with the artistic spirit of individuality. Along with Gropius, and many other artists and teachers, both Laszlo MoholyNagy and Herbert Bayer made significant contributions to the development of graphic design. Among its many contributions to the development of design, the Bauhaus taught typography as part of its curriculum and was instrumental in the development of sans-serif typography, which they favored for its simplified geometric forms and as an alternative to the heavily ornate German standard of blackletter typography. On the right is a picture of the Curtain Wall at the Bauhaus. Known for his versatility and the fundamentals of design which he taught his students, Laszlo replaced Johannes Itten as director of the Bauhaus in 1923. He experimented in many different fields including photography, typography, sculpture, painting, industrial design and printmaking. His experimentation across multiple mediums led to graphic design work characterized by bold typography in combination with striking photography. After he resigned from his position at the Bauhaus in 1928 he spent time working in Berlin as a film and stage designer. In 1937 he moved to Chicago and formed the New Bauhaus, which is now the Illinois Institute of Technology. The school shared the same philosophy as the original Bauhaus and caught on quickly. He chronicled his efforts to establish the curriculum of the school in his book Vision in Motion. Lazlo Moholy Nagy, around 1927. The pieces on the opposite page is “Am 7 ” (left), “The Olly and Dolly Sisters“ (top right), and “A-19” (bottom right). Bayer was both a student and a teacher at the Bauhaus and worked in a wide range of fields including painting, sculpture, typography, advertising and architecture. In his early years as a student he studied painting with Kandinsky, but in just a short while he was teaching one of the Bauhaus’ first classes on typography. The amount of work that he created before he was 28 was more notable than most designers entire careers of work. He spent time teaching at the Bauhaus, working as an Art Director for the Container Corporation and as an architect in both Germany and America In between his time at the Bauhaus and his career in America he spent time as the Art Director of Vogue magazine’s Berlin office. His contributions to the fields of graphic design, typography and advertising were many. One that should be noted was his design for a typeface that consisted of entirely lowercase letters. The German blackletter types were overly ornate for his taste and their use of capital letter for every proper noun was annoying. Logically, Bayer developed a sans-serif alphabet of lowercase letters titled “Universal”. In 1946 Bayer moved to Aspen, Colorado where he spent much of his time designing local architecture and posters for the local community. In 1959 Above is a picture of Herbert Bayer. The piece on the opposite page on the right has one of Bayer’s many self-portraits. The piece on the left is an example of Bayer’s design work done for the Container Corporation of America. he designed another sans-serif typeface. Again it was all in lower case, but he called it “fonetik alfabet” and it contained special characters for the endings -ed, -ion, -ory and -ing. He is one of the most recognized designers to come from the Bauhaus institution and his theories of design are still taught in many schools today. Tschichold claimed that he was one of the most powerful influences on 20th century typography. There are few who would attempt to deny that statement. The son of a sign painter and trained in calligraphy, Tschichold began working with typography at a very early age. Raised in Germany, he worked closely with Paul Renner (who designed Futura) and fled to Switzerland during the rise of the Nazi party. His emphasis on new typography and sans-serif typefaces was deemed a threat to the cultural heritage of Germany, which traditionally used Blackletter Typography and the Nazis seized much of his work before he was able to flee the country. When Tschichold wrote Die Neue Typographie he set forth rules for standardization of practices relating to modern type usage. He condemned all typefaces except for sans-serif types, advocated standardized sizes of paper and set forth guidelines for establishing a typographic hierarchy when using type in design. While the text still has many relative uses today, Tschichold eventually returned to a classicist theory in which centered designs and roman typefaces were favored for blocks of copy. He spent part of his career with Penguin Books and while he was there he developed a Above is a picture of Jan Tschichold. standardized practice for creating the covers for all of the books produced by Penguin. He personally oversaw the development of more than 500 books between the years 1947-49. Every period of his career has left a lasting impression on how designers think about and use typography, and it will continue to affect them into the future. A pioneer of modern typography, designer Piet Zwart was influenced by Constructivism and De Stijl. His influence shows in his work and in this quote: ...to make beautiful creations for the sake of their aesthetic value will have no social significance tomorrow.... Zwart worked as a designer, typographer, photographer and industrial designer in the Netherlands in the 1920s and 30s. Primarily working for the NKF Company, he created many works of graphic design before retiring from the company to spend the rest of his days as an interior and furniture designer. Also influenced by the Arts and Crafts movement, Zwart began his education at the School of Applied Arts in 1902. He spent most of his career moonlighting as an architect and photographer, as well as a designer and for several years he was very successful. His design career came to a halt when he was arrested by German soldiers in 1942. He was eventually released after the war, but the experience affected him drastically. He spent the rest of his life primarily working in interior design. His excellent use of color, typography, composition and photography are reminiscent of the Bauhaus and his influence on the future generations of graphic designers lives on through the Piet Zwart Institute at the William de Kooning Academy. Piet Zwart is pictured above. On the right is â&#x20AC;&#x153;Series of Monographs on Film Arts, No. 7, American Film Artsâ&#x20AC;? by Piet Zwart. been speculated that the breakdown came as a result of a disagreement about the directions of lines in their paintings. Van Doesburg moved to Switzerland in 1931, due to his declining health, and it was there that he died, on March 7th. Albers was a student of the Bauhaus in Dessau, Germany and was a practicing artist in the fields of design, typography, photographer, painter, printmaker and poet. His most influential work was created in the field of abstract painting and it showed an influence of both the Bauhaus and the Constructivists with its simplified geometric shapes. However, he also proved to be very influential to many other graphic designers and artists as a teacher at the Black Mountain College in North Carolina from 1933-49 and at Yale University in Connecticut from 1950-58. His series Homage to the Square is an example of his disciplined approach to composition and color theory. Towards the end of his career he and his wife established the Joseph and Anni Albers foundation in an effort to continue sharing and promoting the theory that he had established during his career. His style and work represent a bridge between the European art of the Bauhaus and Constructivists and the new American Art that emerged in the 1950s and 60s. He was a teacher and an artist his entire career, until his death in 1976 at the age of 88. Josef Albers pictured above. On the opposite page is Albers’ “Homage to the Square: Gained” done in 1959.
the bauhaus: preliminary course The Bauhaus masters developed an innovative teaching program with the creation of a six-month-long preliminary course or â&#x20AC;&#x153;Vorkursâ&#x20AC;? by Johannes Itten. Other professors such as Laszlo Moholy-Nagy, Josef Albers, Paul Klee, and Wassily Kandinsky are associated with the Bauhausâ&#x20AC;&#x2122;s preliminary course. The course was an introduction to composition, color, materials, and three-dimensional form that familiarized students with techniques, principles, and formal relationships considered fundamental to all forms of visual expression. The basic course developed an abstract visual language that would provide a theoretical and practical foundation for any artistic endeavor. Because it was seen as a basis for all further development, the course aimed to strip away particularities in favor of discovering fundamental truths operating in the visual world. Every student had to complete this preliminary course before he or she could enter the workshop of his or her choice (sculpture, metal work, painting, lettering, etc.). Teachers and students alike worked together as a team. The Bauhaus put a huge emphasis on experimentation and problem solving, which became widely influential for the approaches to art education. Image of the sun casting a shadow of the Bauhaus sign. anderson university: foundations 105 and 106 The professors at Anderson University created a Foundations program that rivals that of the Bauhaus, and is unlike any other foundations program in the country. It is a two-semester, team taught course—ART 105 and ART 106—in which students are prepared for work at the upper levels in art and design. Like the Bauhaus, ever y student must take Foundations before they take courses related to their concentration. Jo Carol Mitchell-Rogers, Nathan Cox, Susan Wooten, and Peter Kaniaris created the Foundations program Anderson has today after they recognized they were dissatisfied with how the course was being taught. They gathered in Rainey Room 149 with white boards, markers, and paper and rethought the way art fundamentals had traditionally been instructed. They decided to focus on the students’ needs and created five learning outcomes or goals of Foundations. Later, the art department adopted the five goals into every course regardless of concentration. Even senior level courses are structured by these goals. The five goals are: (1) communication; (2) formal exploration; (3) creative visual problem solving; (4) exploration of tools, materials, and techniques; (5) investigation of history, theory, and methodologies. Anderson University’s sign. Like the Bauhaus and other foundations programs, students learn design terminology and the practice 2-D and 3-D design, color theory, and drawing/rendering problems. The difference between Anderson’s Foundations program and that of the Bauhaus is the incorporation of a conceptual element into projects. Students do not just create something that looks pretty; there has to be a deeper meaning and purpose behind it. We have creativity with teeth. This diagram designed by Walter Gropius in 1922 illustrated the structure of the school curriculum. The outer “Vorlehre” represents the preliminary course. The two middle rings represent the three-year period of workshop training together with form theory. The workshops are identified in terms of their materials; “Holz” (wood) stands for the wood- car v ing wor kshops. Buil ding (“B au”) w as the f inal , highest stage of education. This diagram illustrates the structure of AUâ&#x20AC;&#x2122;s art program. The outer ring represents the Foundations course. In foundations, students are introduced to the art departmentâ&#x20AC;&#x2122;s five learning goals that will follow them throughout the course of their career at Anderson. Within Foundations, students are taught things like color theory and 3-D design. Students are also introduced to concept development, which distinguishes AU from the Bauhaus. After Foundations, students move into their concentrations and then graduate. design problem 1: compositional studies This is the first “problem” or project you will do as a freshman in our Foundations Program. It is known as “the line project.” You will learn to arrange lines within various formats (circles, rectangles, squares) in relation to various principles of design and Gestalt theory. These compositions are to be non-objective or non-representational. You will use black construction paper and X-acto knives to cut out the lines and arrange them on the various formats. Craftsmanship and time management are of the utmost importance in this project. This project is very similar to a project given in the preliminary course at the Bauhaus. In Kandinsky’s class, he had his students do “Point and Line to Plane” exercises. Kandinsky’s assignment focused on creating visually interesting and balanced compositions, which is what AU’s first design problem is all about. Gestalt Principles stem from a theory of visual perception that emphasizes the importance of holistic composition. According to this theory, grouping, containment, repetition, proximity, continuity, and closure are essential aspects of visual unity. Non-objective representation is work that portrays no recognizable imagery or subject matter. Compositional line studies that Kandinksy had his students do at the Bauhaus. The project on the right was done by Brinson McGowan. Diptychs are composed of t wo separate, but conceptually and visually related images. Collages are images constructed from visual or verbal fragments initially designed for another purpose. approach with the incorporation of communicating external and internal characteristics. design problem 3: contour drawing This problem serves as your introduction to drawing. Drawing is the beginning of the creative process for many purposes in many art disciplines. This project is highly representational. You will learn how to draw from direct observation, and will be assigned various practice-drawing assignments before you are given the actual problem. By the end of this project, you should be able to show your ability to look carefully, draw intentionally confident lines, and deliver an accurate description of the subject. Design Problem 3 is similar to what was taught in the preliminary course at the Bauhaus in terms of learning how to draw from observation. This particular Foundations project is not conceptual. Contour lines are lines that describe the edges of a form and suggest three-dimensional volume. The student artist of the piece on the opposite page is unknown. Representational shapes are derived from specific subject matter and are strongly based on visual observation. On the right a close up of Iina Kobayashiâ&#x20AC;&#x2122;s drawing, Opposite is her full-scale piece. that except the inspiration must come from an art historical piece. Value is the relative lightness or darkness of a surface. The image above is a color study done by a student at the Bauhaus in the Preliminary course. The pieces on the opposite page are conceptual color studies by AU students. The left piece was done by Joy Hiller and conveys “isolation.” The composition below conveys “frenzy” and was done by Hayden Oliver. The color studies on the next page were done by Ellie Youngs. also asked to examine the expressive potential of color. design problem 1: drawing: value and perspective This marks the first problem of the spring semester of Foundations. For this problem, you will draw from a still life that consists of both boxes and fruit. You select an area of the constructed still life in order to create an interesting composition. The composition and your rendering should communicate an illusion of form and space on the flat surface of the drawing paper. This project should be highly representational. In order to achieve this, you will have to pay close attention to perspective cues, values, and the relative size and shape of the objects in relation to one another. This design problem does not include concept development. It is similar to drawing projects taught in the basic course at the Bauhaus and any introductory drawing course. Design problem 1 simply teaches you how to draw using perspective and translating value. Perspective is a form of geometric perspective in which parallel lines are represented as converging in order to give the illusion of depth and distance. Above is a drawing by a student in Itten’s preliminar y course at the Bauhaus. The drawing on the right was done by Iina Kobayashi. On the left is a piece done by Emily Heinz. The piece on the opposite page drawn by Hayden Oliver. design problem 2: fortune telling (value diptych) This project combines the drawing skills learned in the previous project as well as the concept forming skills learned in other projects. This problem requires the creation of a diptych (like Problem 2 in 105). The first panel will be a rendering from direct observation of a fortune cookie, and the second panel will illustrate your symbolic interpretation of the fortune found within the cookie. Like the diptych in 105, this project is heavily conceptual. You will need to find an original and creative visual interpretation of your fortune. Design Problem 2 is unlike any project given in the preliminary course at the Bauhaus. It takes the drawing skills learned in the fruit and boxes project and pushes them a step further by adding a conceptual element. It is similar to the Bauhaus in that it helps refine technical drawing skills, but it is different in terms of concept development. Pictured on the opposite page is a project by Railey Collins (with detail). The work on the next page was done by Hayden Oliver. design problem 3: color mixing For this problem, you will deal with the optical, not physical, mixing of color. It stems from artists like Seurat and Signac who are known for their pointillist work. This problem is usually a favorite among those who want to become graphic designers. It requires the mixing the colors cyan, magenta, yellow, and black (CMYK). These are the four colors of ink that are used in the printing process. Along with figuring out how to mix these four colors to get a wide range of colors, you will have to select, modify, and combine at least two black and white photographic images. With these images, you will create a completely new composition. The combination of these two images should be highly conceptual. From these images, you will translate the value in the photographs to the value in color. The color palette you choose to use with these images must also relate back to your concept. This problem is different from any project assigned in the basic course at the Bauhaus. It is synonymous in terms of learning about coloring mixing, but the medium and conceptual approach is dissimilar. Design Problem 3 is done in Prismacolor marker while Bauhaus preliminary color studies were done in gouache paint. The piece on the right was done by Joy Hiller. Close ups from left to right are by Sarah Leugemors, Heather Burton, Iina Kobayashi, and Brinnan Wimberly. Abstract form is a form derived from visual reality that has been distilled or transformed, reducing its resemblance to the original source. Above is a project that was done in the preliminary course at the Bauhaus. The sculpture on the right, by Joy Hiller, is a monument advocating the envrionmental fight against toxic industrial materials. has meaning and serves a purpose. Brinson McGowan created this momument model about the Chernobyl nuclear reactor explosion. Photos by Brinson McGowan. Intensity is the purity, saturation, or chroma of a color. For example, fire engine red is a high-intensity color. Above is a color wheel that was done by a student in the Preliminary course at the Bauhaus. The piece on the right was done by AU’s Brinson McGowan. books Droste, Magdalena. Bauhaus. Kรถln: Taschen, 1998. Print. Fiedler, Jeannine, Peter Feierabend, and Ute Ackermann. Bauhaus. Cologne: Kรถnemann, 2000. Print. Tim Speaker for overseeing the production of this magazine. Jo Carol Mitchell-Rogers for explaining Foundationsâ&#x20AC;&#x2122; story. Nathan Cox for providing all the Foundations paper work. Jane Dorn for giving valuable suggestions and feedback. Kelly Johnson for providing pictures of student work. Anderson University art students for providing the artwork. 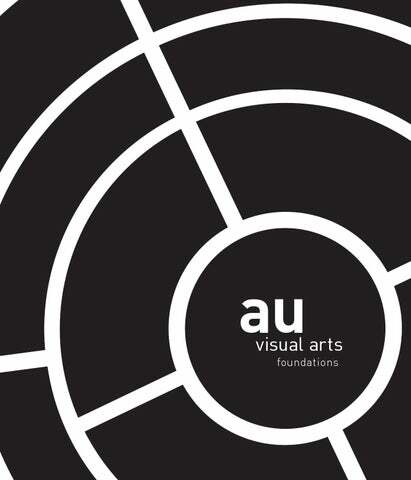 A Magazine for Anderson University Visual Arts prospective students.